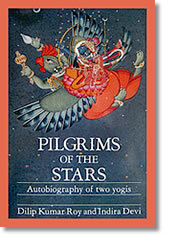 Pilgrims of the Stars is an autobiographical account of the inner journey of two remarkable contemporary Indian yogis- Dilip Kumar Roy, a renowned musician, philosopher, and scholar, and his disciple Indira Devi, a visionary poetess and dancer. A spiritual classic, Pilgrims of the Stars offers the reader an inspiring and humorous glimpse into the daily struggles and victories of two great souls. Dilip Kumar Roy describes his spiritual training by his Guru, the Indian statesman and saint Sri Aurobindo, and his meetings with Mahatma Gandhi, Rabindranath Tagore, Ramana Maharshi, and other spiritual luminaries. Indira Devi's candid memoirs of life and her Guru have a special beauty and simplicity, and contain a wealth of practical advice for spiritual aspirants. ". . . as remarkable as it is rewarding for the reader."